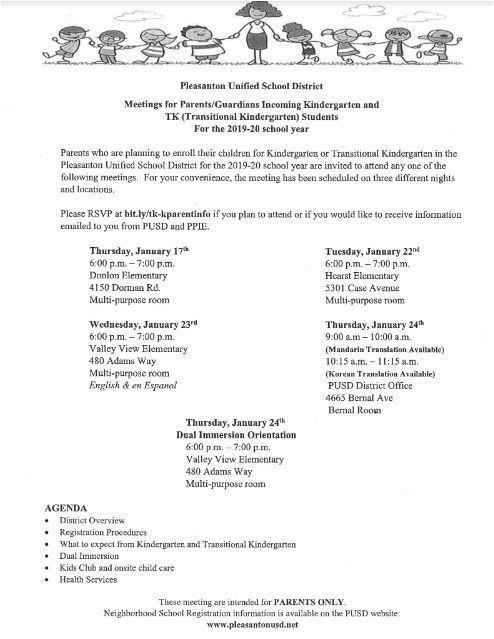 Families of new TK and kindergarten students for the 2019-20 school year are invited to attend one of three upcoming parent information nights in January 2019. Tuesday, Jan. 22, 6-7 p.m.: Hearst Elementary, MP room (5301 Case Ave). Neighborhood registration for new TK and kindergarten students will begin in February 2019. Visit the PUSD Student Support Services for more information on these important events!